(MarketersMedia) — The SevenTablets Architecture for Cross-Platform Design and Development, or STAX, has received a major update, the company reported. With the previous version of STAX enabling reductions of up to 40% in cross-platform mobile application development costs and time to market, SevenTablets projects that the updated release will produce further gains of as much as 20%. Helping clients increase their revenues, cut costs, and improve operational efficiency with B2B mobility solutions as detailed at https://seventablets.com/, SevenTablets is one of the nation’s leading full-spectrum iOS and Android application development agencies. Ever since the earliest days of digital computers, the value of appropriate, strategic software reuse has been clear. While many software development projects mandate a thorough understanding of unique, particular requirements, most also involve, to at least some extent, the retreading of well-traveled ground. SevenTablets’ proprietary STAX mobile application development framework was created to account for this complex but fundamental reality of the software development process and to deliver real, reliable cost and time savings and other benefits. In addition to cutting development times and expenses by allowing for the easy reuse of pre-built components, the environment-agnostic framework also enables deployment of a single application to mobile devices, cloud-based virtual machines, or data-center-hosted servers. Unlike many other frameworks, STAX provides for the installation of only those libraries that are specifically required by a given app, conserving precious resources and improving performance. The royalty-free OpenMEAP-based framework also scales in a linear fashion up to 100,000 transactions per second or more, while still delivering response times of 200 milliseconds or less. The newly updated version of STAX now in use by SevenTablets builds on these strengths and others, delivering improved results of up to 20%. As is detailed at http://SevenTablets.com/about, SevenTablets provides a full range of B2B mobility solutions services, from app strategy, creative consulting, and development, to analytics, security, and cloud hosting, with STAX contributing in a number of crucial ways. Situated in Dallas, one of the country’s most dynamic and vital business environments, SevenTablets works closely with every client to arrive at the best possible answers for each. With the company’s updated STAX framework now being employed to help clients cut costs, boost revenues, and improve operational efficiency, those interested are invited to get in touch using the contact details found at http://SevenTablets.com/contact. 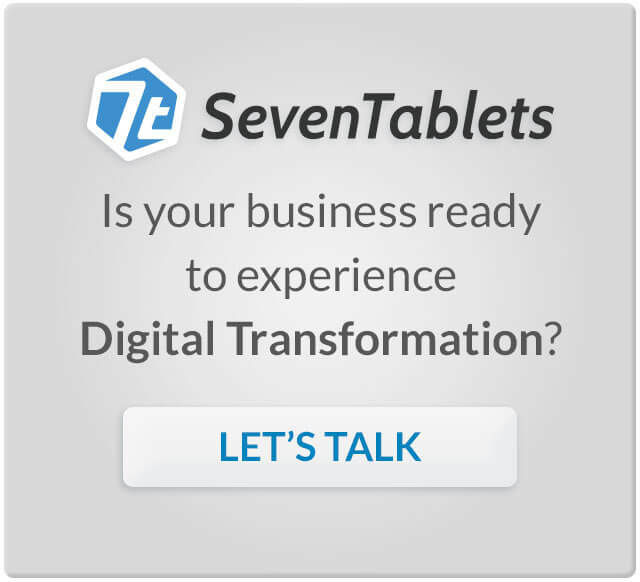 About SevenTablets: SevenTablets is a Dallas, Texas based digital transformation leader with expertise that spans the most advanced mobile platforms including predictive analytics, natural language processing, augmented reality, artificial intelligence and disparate database cloud integrations. The company uses its business first approach to create cutting-edge business solutions that streamline operational efficiencies and accelerate revenue.